Today IMC broke ground on the new Las Vegas Expo Center, scheduled to be built by June 2020. With the company's recent announcement of its $280 million investment in its properties, there's a lot to unpack. Here's how IMC envisions the future of markets. It could not have been a brighter or more perfect January day to start a new beginning. 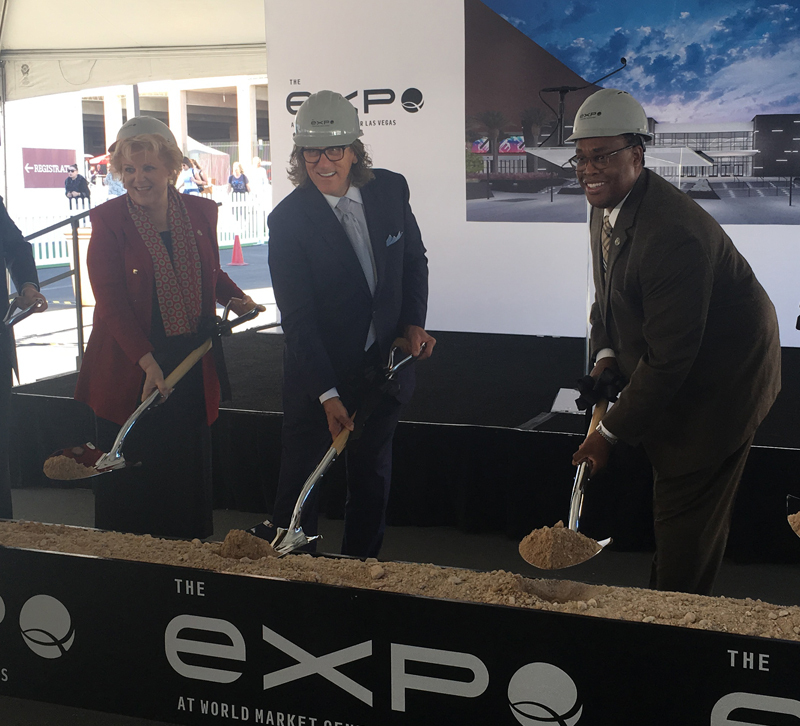 This morning, International Market Centers (IMC) and the City of Las Vegas held a groundbreaking ceremony at World Market Center, symbolizing the start of construction on the new Expo Center. IMC Chairman Bob Maricich, Mayor Carolyn Goodman and Ward 5 Councilman Cedric Crear delivered remarks before donning construction hats and digging in. Last summer, IMC announced it had partnered with the city of Las Vegas to build a new exposition center in the downtown area. Downtown Las Vegas — which does not include the Strip — has just 80,000 square feet of exposition space, and this new center will add more than 190,000 square feet of space, 315,000 square feet of space in total. World Market Center and downtown Las Vegas currently sit in Ward 5, which has an unemployment rate of 15 percent compared to 5 percent of the whole city, according to Crear. In addition to bringing new business to IMC properties, the Expo Center is poised to bring jobs and opportunities to the area. "We are prepared," Crear said at the groundbreaking ceremony. "We are growing." Together with IMC's planned $280 million investment in its properties, the company — which owns Las Vegas Market and now AmericasMart Atlanta and operates some of the biggest buildings in High Point Market — has big plans for future markets. Here's what to know about IMC's plans for the future and what it might be like to attend market one day. The new Expo Center will be located right next to Building C at World Market Center. As Maricich described it to press attendees at an event last night, the north wall of Building C was constructed with expansion in mind and is false. It can be taken down, and the Expo Center will be attached to it. The parking garage next to Building C will come down, and the Pavillion tents will also be removed. That area now, which stretches for 21 acres, will be paved, and Maricich hinted that more expansions could be on the horizon. But that doesn't mean the Temporaries are going away. In fact, Maricich said, the Temporaries have been having their fullest show at Las Vegas yet. They will be relocated into the new Expo Center. If you're concerned that the construction will impact your summer market, never fear. Maricich said foundation work would be done during the summer, and after market ends, the real work would begin. Room for another Vegas expo center? Maricich confessed that eight years ago, he said another hotel would not be built in Las Vegas in his lifetime, but with another hotel going up near World Market Centers and a medical district being constructed nearby, he's had to eat his words. Though Las Vegas may be a big tourist destination as well as a great spot for conventions, most of the money has historically stayed on the Strip with the big resort hotels and casinos, leaving the rest of the city financially strapped. Three years ago, the local government of Las Vegas became heavily involved in the project in an effort to revitalize the economy in downtown Las Vegas. IMC will be paying workers the prevailing wage rate, and its general contractor will be hosting job fairs to get local people to come work. The city will be contributing $30 million to the project's $76 million. "This is really a distressed economic area around here," Maricich told the press last night. "It's formally an economic development zone." By building the Expo Center away from the Strip, Maricich says new trade shows and conferences will be free to make deals with hotels anywhere in the city, be that downtown or on the Strip. That could mean better hotel rates for marketgoers. "We're Switzerland," Maricich joked. "If somebody wants to have a trade show with us, they can partner with the Golden Nugget and get a $59 or $99 room rate, or they can partner with the Four Seasons. We're not locked into putting heads-in-beds, as the gaming people call it." But more than furniture shows, the Expo Center offers IMC the chance to bring in new conferences and trade shows, and already, companies are expressing interest. The Gift & Home CEO Summit will return to Las Vegas this summer, and he hinted that IMC will be looking to bring other shows to its space. From this expansion, IMC envisions a market where all types of buyers have access to what's new and next. What do you think of IMC's plans for the future?share with us in the comments!